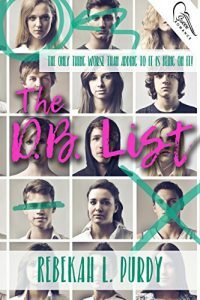 Seventeen-year-old Ellie Gebhardt has spent the last three years of high school in psychotherapy, trying to fix a very broken her. And her shrink (or therapist as she likes to be called) seems to think that in order to totally heal, she needs to recognize all the good and bad things that have led her to this point. As if a trip down memory lane will suddenly make her better. She’s given a “homework” assignment to create two lists. One with nothing but happy memories and thoughts on it (otherwise known as the ‘happy rainbow farting unicorns list’). And the other with everything negative that Ellie thinks contributed to “the” day she could no longer cope. So begins Ellie’s Douche Bag list (or D.B. List for short). And once she gets started, it’s hard to stop remembering all the jerks, the petty crap, the times she’d been bullied or the main focus of the rumor mill. So when nice guy, Ky Laramie, walks into her life, Ellie instantly puts her shields up. But as she gets to know him and his family, she wonders if she can dare to put herself out there again. Because as everyone knows, once a candle is lit, the wind can always blow it out. And Ellie couldn’t handle it if Ky ends up atop of the D.B. List. I was born and raised in Michigan (just look for the giant mitten on the map—it’ll likely throw a snowball at you). I spent most of my time in Michigan, but while in the army got to call KS, SC, MO, and CA home for awhile as well. As a kid my family moved around a lot. Try spending both your freshman and senior years at new schools (yeah, loads of fun). I could’ve changed my name to “new girl”. I love writing for teens because those are the years I remember falling in love with most of my favorite books. Some of the authors I couldn’t put down were L.J. Smith, Christopher Pike, R.L. Stine, Richie Tankersley Cusick, Joan Lowery Nixon, Lois Duncan, amongst several others. My husband and I have a large family. There are six kids total! So we have LOTS of fun on vacations (although hours on the road, cooped up in the Expedition is kind of stressful—although we pass the time with MAD LIBS and hoping no one gets carsick).